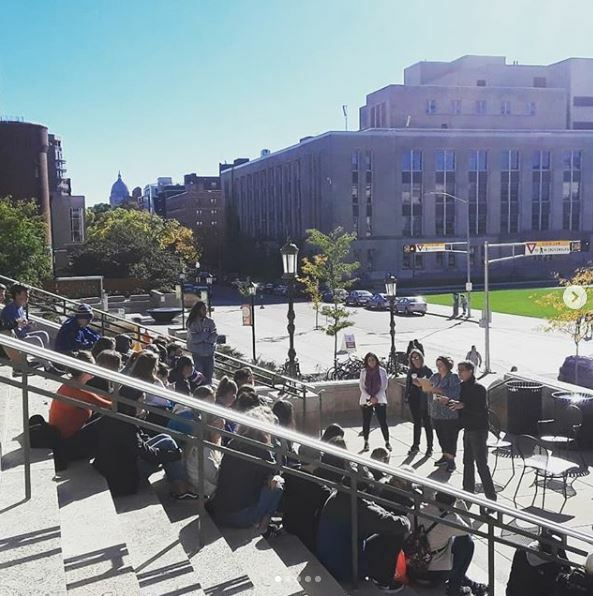 Omar Poler, Sokaogon Chippewa Community member and Outreach Specialist with the UW School of Education, led a tour for nearly 50 students from Madison West High School in early October. These juniors and seniors enrolled in Wisconsin’s First Nations, a social studies course and the first of its kind in the Madison Metropolitan School District. The tour focuses on the long history and place-based cultural importance of the Ho-Chunk people, on whose ancestral land the University sits. Carrie Bohman, a teacher at West, arranged for her two classes to walk to campus, “to get a feel for how important it is to walk the land, to feel the Earth under your feet.” Earth Partnership was pleased to support this field trip. Previous post: NEW Pollinator Habitat Guide from Earth Partnership — available now online!